Another popular Cambridge style is the products that comprise the RoundTable Collection. These Cambridge pavingstones with ArmorTec have dimpled, embossed surfaces that gently roll into soft, beveled edges. However, the shapes are all straight-sided. Pavers are available in individual sizes or as a design kit pattern. In addition, circle kits are available to accent your installation. Available in luxurious colors, such as chestnut/salmon, canyon blend, ruby/onyx in 4-1/2 x 6 pavers. In the 6 x 6 size, color choices range from toffee/onyx, sahara/chestnut/lite, sandstone and golden/onyx, among others. 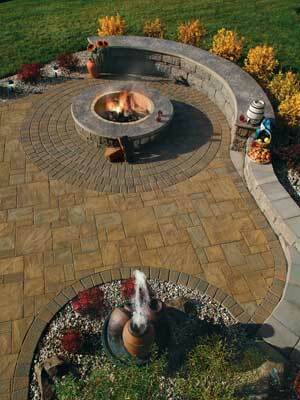 The largest individual paver size, 6 x 9, is offered is onyx/chestnut, toffee/onyx/mauve, bluestone blend, and more. These pavers can be used to create your own custom design, or for use with the kits available. The Circle Design Kit comes in colors like sahara/chestnut, and the Random Design Kit is available in onyx/natural and many others. QuartzTec features Genuine Quartz Crystals. QuartzTec with ArmorTec is derived from Cambridge’s popular 2 3/8″ thick, 6 x 6 and 6 x 9 pavers from The RoundTable Collection, which feature gentle, rolled edges. Advanced equipment and a superior manufacturing process is used to produce this type of paver. QuartzTec pavers are “shell-colored” by infusing genuine black quartz crystals during production, creating a striking salt-and-pepper-like appearance as a result. Just a note: When compacting pavingstones from the RoundTable Collection, a professional should use a compactor with a bolt-on urethane protection mat as a precaution against scuffing. Another option is to place a heavy-duty filter fabric, known as a geotextile, over the pavers before compaction. Cambridge products, including the RoundTable Collection are color-fade resistant and feature a smooth surface. As a precaution against scuffing when compacting pavingstones from the RoundTable Collection a compactor with a bolt-on urethane protection mat should be used. As an alternative, place a heavy-duty geotextile (filter fabric) over the pavers prior to compaction. All dimensions quoted in this catalog are nominal and are for guidance only. Actual sizes will vary, particularly on the products designed to replicate natural stone which have features such as riven profiles and fettled edges. The size and quantities given usually allow a nominal 5mm or more of sand joint width. Your final selection should be made from actual samples obtained from your Authorized Cambridge Distributor or professional pavingstone contractor. Cambridge Pavingstones colors match or complement Cambridge Wall Systems colors. If you cannot find the color you are looking for, inquire about The Cambridge Custom Color Program through any Authorized Cambridge Distributor. The Cambridge ColorLab can match any desired color.